What is Parelli Horse Training? Want to learn about Parelli horse training? You’re not alone. The Parelli Natural Horsemanship method is one of the largest natural horsemanship programs. The step-by step approach and focus on the quality of the relationship with the horse has those from recreational riders to professionals all over the world learning this method. Parelli students PLAY with their horses, and work on themselves! It is an attitude of having fun, making it interesting for both equine and human but still getting the job done. This method will teach you how to get in your horses’ head and learn what makes him tick! The first three games, the friendly, porcupine, and driving games are the principle games or foundation for the rest of the games. These Parelli games are like learning your ABC’s. The other four games are the purpose games that build on the principles in the first three games. Games 4-7 teach you how to form words, then sentences in the language of communication with the horse. These games are played by all horses, but Parelli both identified and named them, giving students an easy way to identify the quality and progression of training in different areas. This approach is unique among the different natural horsemanship trainers available. Here is a brief introduction into the seven games. This game is all about getting and keeping your horses’ trust and confidence. It is listed as number one and is the foundation of Parelli horse training because without confidence, horses can't learn. Horses are prey animals wired to run from danger. If he doesn’t trust that you aren’t going to eat him for dinner then you won’t accomplish much. Also if he is not confident in himself as a learner and his surroundings, any horse training techniques that are used aren't going to be as effective. The game of steady pressure. Horses naturally push through pressure. In the wild if a lion jumps on their back they push through that as strongly as they can to get away! This game teaches them to yield to/from pressure appropriately for interacting with people. It helps with everything from leading and tying to getting a horse soft on leg and bit cues. The Driving game in Parelli horse training is the game of rhythmic pressure. It teaches horses to yield to pressure off a suggestion or intention in your body only touching the horse if he doesn’t follow the suggestion. It is very good for keeping a horse out of your personal space and teaching him to yield all the different parts of his body. The yo-yo game is all about straight lines and having the horse drive away from you and draw back to you in equality. It is called the yo-yo game because like the yo-yo toy it is name after it goes down and up, straight and equal if you do it right! Most horses have either more whoa or more go, and this game will help balance that out. A higher level example of the yo-yo game in Parelli horse training would be a sliding stop. Another example is walk-canter-walk transitions. The circling game is not traditional lunging although it may look somewhat alike at times. The circling game has three parts, the send, the allow, and the bring back. You send your horse out on a circle, allow him to stay out there at the gait/distance you set without constantly nagging him to keep moving, and then bring him back when done to end the game. This Parelli horse game teaches the horse his responsibilities to maintain gait and direction, but not as a mindless robot. The point is for him to still be connected to you, respectful and confident enough to do what you have asked with his body arced in the proper direction for the circle whether it is online or while mounted. It also teaches the human how to be neutral and not nag at the horse constantly. Sideways in horses requires them to be thinking and coordinated. Pat Parelli says “The better your horse goes sideways and backwards, the better he will do everything else.” Sideways is an essential skill for any horse and rider ranging from being able to go sideways to open a gate up to flying lead changes and lateral work. Horses are born claustrophobic! They don’t want to be trapped because then they can’t run away from danger. In Parelli horse training, the squeeze game teaches horses to be more confident in tight situations. This is everything from standing in a wash stall, jumping (over a squeeze) to trailer loading (all around squeeze). This helps the horse over ride his instinct to panic in claustrophobic situations and become more confident with all kinds of obstacles. 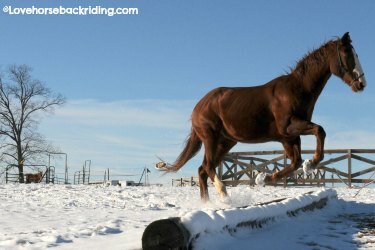 In addition to breaking down the mechanics of playing with horses into the seven games, Parelli horse training also has specific levels of training that the human can achieve. These levels are similar to obtaining a martial arts belt and when they are officially passed, you receive a colored “savvy” string that corresponds to the level that is obtained. What’s With The Orange Stick and Long Rope? In Parelli horse training you will often see people using a four foot long orange stick with a string attached to it. This stick is called a “carrot stick” and is used as an extension of your arm to communicate with the horse. It is not a whip. Parelli students also use a soft rope halter and usually start on a 12 foot rope. Later you progress to a 22, or 45 ft rope, and eventually no rope which is called liberty. 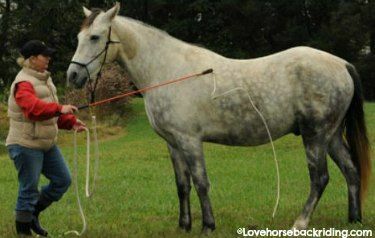 The different lengths of rope first help you keep your horse out of your personal space and then later test your communication with him from farther away and then at liberty. There are also certified Parelli instructors to learn from, or you can become certified yourself if you desire to be a professional instructor or horse trainer in this method. Becoming an instructor requires learning at one of the Parelli Centers as well as attending a course for instructors. Instructors in Parelli horse training can also achieve rated levels of instructorship. Currently, levels one through four (there are 10 levels total) are available as a home study program. There is also an online community available through a monthly fee-based subscription called the Parelli Savvy Club simply known to members as the Savvy Club. There is also Parelli Connect which is like Facebook for Parelli people. Parelli Connect has additional information, online learning videos, tasks you can complete with your horse as well as an online journal of your progress as well as support from your local Parelli community. Passing level four would certainly render you a well-rounded horseman/woman. Horse training Parelli style says that level 4 is about where the human starts to know enough to teach the horse. It is in level 4 that you would start to learn specializations such as dressage, reining, jumping, and cutting. While Parelli horse training isn’t for everyone (it is not a quick fix) it is for those seeking a solid foundation and knowledge of horses and horsemanship. You must be willing to devote the time it takes to learn how a horse thinks to be great with horses both on the ground and in the saddle. In the process you will also learn and grow as a person.